Manager Craig Renshaw hailed the best performance of the season by his Kirkham Juniors Reds as they scored six second-half goals in a 7-0 victory over Thornton Cleveleys Whites in the Blackpool and District Youth League under-15 competition. 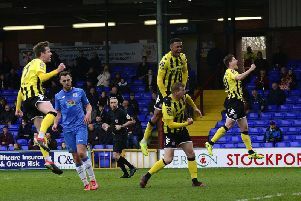 Dom Turner scored a second-half hat-trick and Reece Johnson netted two as both sides lost their goalkeeper to injury during this Coronation Road contest. Thornton suffered after losing keeper Kipper Ray to a knee injury shortly after half-time. Harrison Beggeley and Keegan Jones both took a stint between the sticks but couldn’t keep the hosts at bay. Kirkham lost their keeper Krystian Pietryka in the first half when he picked up a muscle injury. Defender Ben Russell replaced him and was outstanding, sealing a clean sheet with an exceptional late save. Both sides had chances in the first half but it was Reece Johnson who claimed the only goal before the break after 17 minutes. Luke Roper went closest for the Whites but was thwarted in a one-one-one. The Whites’ strategy had been to frustrate their hosts with strong defence after a 3-0 defeat last time they met, though they were soon forced into a change of plan when Ray was forced off very early in the second period and Kirkham quickly doubled their lead. It was Alfie Renshaw who made it 2-0, finding the space to fire his shot into the top corner. Kirkham were unstoppable from that point as Turner’s treble included an outstanding free-kick in the top corner. Johnson picked up a second and substitute Deontay Atkinson completed the scoring with a classy finish. The teams meet again this Sunday and Thornton Cleveleys manager Garry Ray says it could be a tough day at the office. He said: “We’ll have to find someone to go in goal next weekend but we are having a good season. There are three really good teams and the rest are mostly very similar, so we’re very pleased to be fourth. For Kirkham boss Renshaw, this was the perfect response to a defeat against title rivals FC Rangers Blues in their previous match a fortnight earlier. Squires Gate are also in the title race and Renshaw said: “We’ll go top if we win our game in hand. And we still have to play Squires Gate and FC Rangers Blues at home. Ben Russell was named the Reds’ man of the match. The defender was unfazed as an emergency goalkeeper, crowning a confident performance with a save to secure the clean sheet. Adam Blackpool was the Whites’ choice, battling on with great determination. He never let his head drop on the right side of midfield.